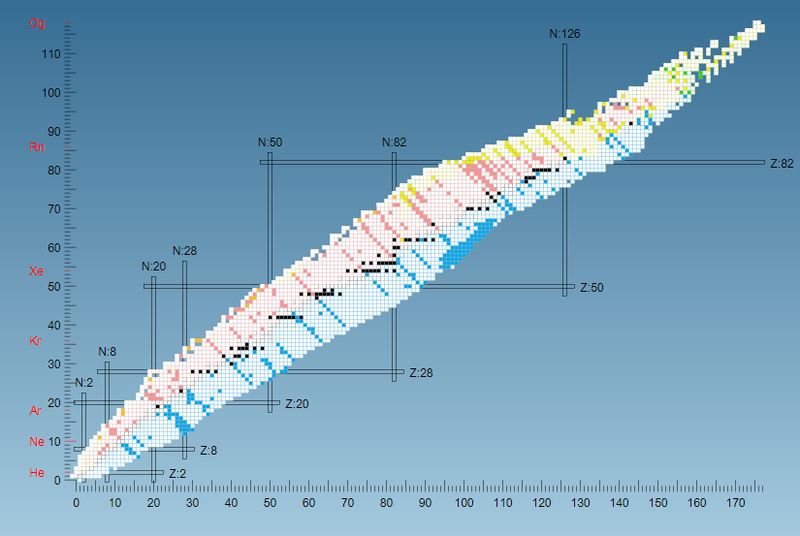 The Karlsruhe Nuclide Chart Online (KNCO++) is an application for displaying the latest and updated experimental data for nuclide ground states and isomers. - The user has access to earlier editions (9th Edition 2015, 8th Edition 2012, 7th Edition 2006) of the Chart and to “difference” Charts which show the difference between editions (e.g. the differences between the 2015 and 2012 editions). - Colour schemes used in the nuclide boxes can be switched from modes of decay to half-lives and vice-versa. 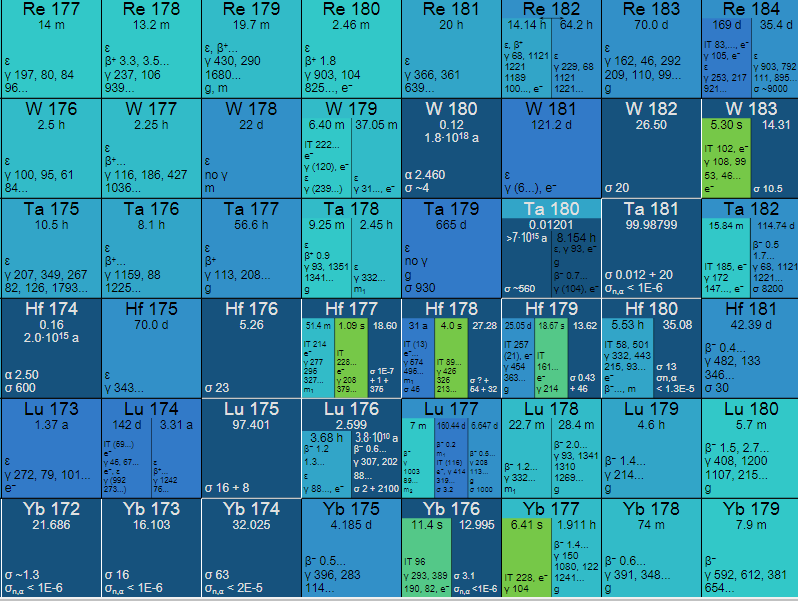 - A new "Dashboard" interface provides access to the Karlsruhe Nuclide Chart Online and supporting applications (What the colours mean, How to use the KNCO++, Physical Constants and Conversion Factors, Fission Isomers, Properties of the Elements, Periodic Table, etc.). - An overview of the nuclide statistics for experimentally observed nuclides for the current and previous editions is provided. - Dedicated Karlsruhe Nuclide Chart glossary is provided with additional support in the Wiki and Blog. The Karlsruhe Nuclide Chart Online, KNCO++ Enlarge showing the traditional colours based on the decay modes. 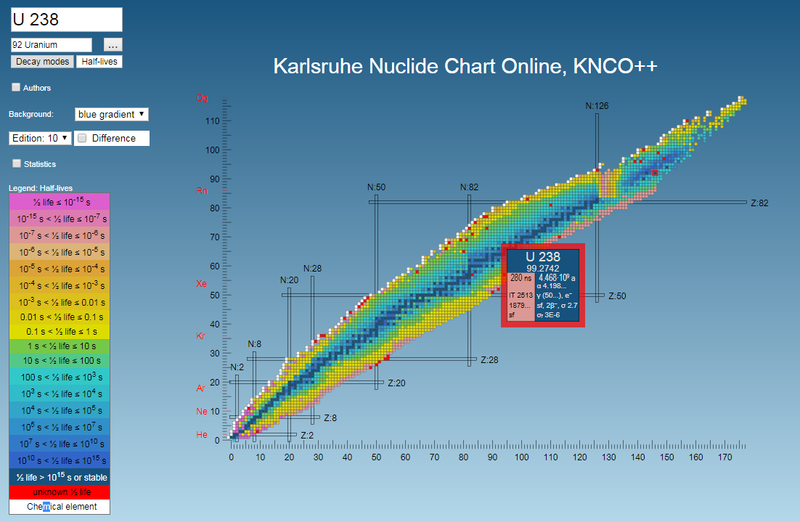 The Karlsruhe Nuclide Chart Online, KNCO++ Enlarge showing the new colours based on the half-lives. Payment can be made via bank transfer or by credit card (handling charge 4%). 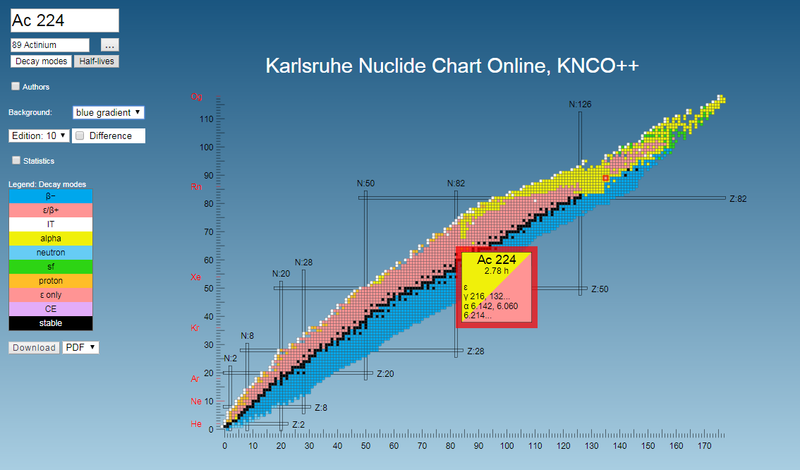 The Karlsruhe Nuclide Chart Online, KNCO++ can be accessed through the Nucleonica nuclear science portal www.nucleonica.com. New users must first register for Free access to Nucleonica. Following receipt of the order, the user account will be upgraded to provide access to the KNCO++. Prices are effective as of 1st January 2018. All rights reserved. Impressum. For general information on the Karlsruhe Nuclide Chart and print versions see Karlsruhe Nuclide Chart. 1. Go to the Nucleonica portal www.nucleonica.com with your internet browser. -- we recommend Chrome and Firefox browsers. 2. Login with your username and password. If you do not have a Nucleonica account, you will need to first Register for Free access. Your login details (username and password) will automatically be sent to your email account. 3. If login is successful, you will land directly on the KNCO++ "App" Dashboard. The KNCO++ is the first application in the top line. Just click on this. Thereafter, the KNCO++ will be launched. Literature references for the nuclide data are now availabe. 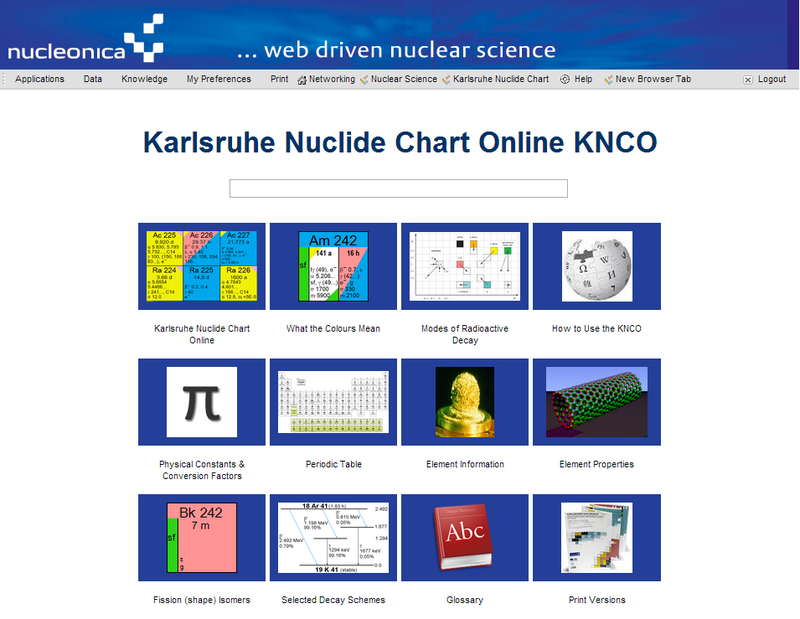 For users with access rights only to the Karlsruhe Nuclide Chart Online++ (hereafter KNCO++) and not to the rest of Nucleonica - the start page is shown below. Users who also have access to Nucleonica (e.g. Premium access), this KNCO++ page appears after clicking on the Karlsruhe Nuclide Chart link in the taskbar. This start page shows an "App" type interface with in total 12 icons. The top left icon is a direct linke to the KNCO++. The other icons are links to supporting applications. Below the page title - Karlsruhe Nuclide Chart Online - there is a search box. The user can enter a character string here. On pressing the Return key, a full search of the Nucleonia wiki is made for this character string. The user can enter a character string here. On pressing the Return key, a full search of the Nucleonia wiki is made for this character string. Clicking on the KNCO++ icon in the "App" interface described above will lead to the following window. 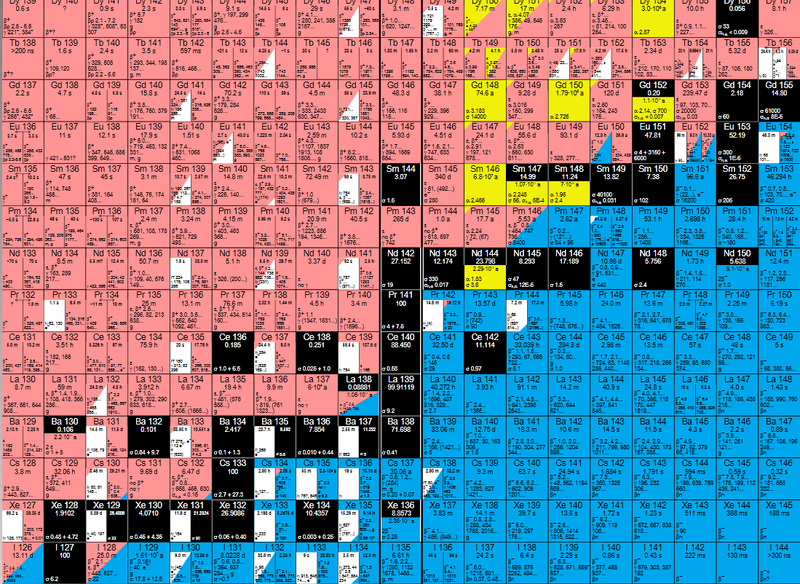 Here the user will immediately recognise a section from the Karlsruhe Nuclide Chart shown in the main panel. The nuclide box structure is the same as that given in the paper-based Charts. The structure of the Navigation panel is shown in the figure. With these icons, the user can zoom in or zoom out of a region in the chart. At any zoom level (beyond the initial level) the user can pan through the selected area by depressing the left mouse button and, holding this depressed, moving the mouse in any direction. With this icon, the user restore the full chart. In the search box, typing in a chemical symbol, e.g. Co, will lead to a list of all cobalt isotopes in the drop-down menu. On selection of a particular isotope, this isotope is then shown in detail in the main window. Below the Search Nuclide box, the type of chart (based on decay modes or half-lives) can be selected. The Authors check box leads to a list of authors and affiliations for the present version of the Karlsruhe Nuclide Chart. From the drop-down menu, the user can select which edition to show in the main window. Currently, the 9th edition is under development. The previous 7th and 8th editions can also be selected. By ticking the check box "Difference", the user can see the differences between two editions. For example, with the edition 9 selected and the check box ticked, the differences between the 9th and 8th editions are shown highlighted in colour in the main window. In the Statistics drop-down menu, basic information is given on the total number of ground states and isomers etc. Nuclide statistics for various editions. An overview of the nuclide statistics for experimentally observed nuclides for the current and previous editions (9th edition 2015, 8th edition, 2012; 7th edition 2006) is shown in the figure. It is of interest to note how the total number of nuclides (ground and metastable states) has increased since the 7th Edition 2006. 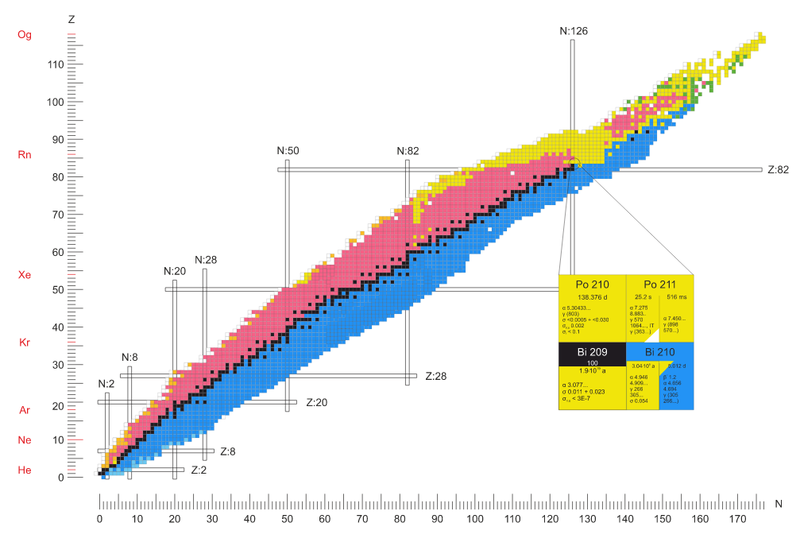 The column new shows the total number of new nuclides in each edition. 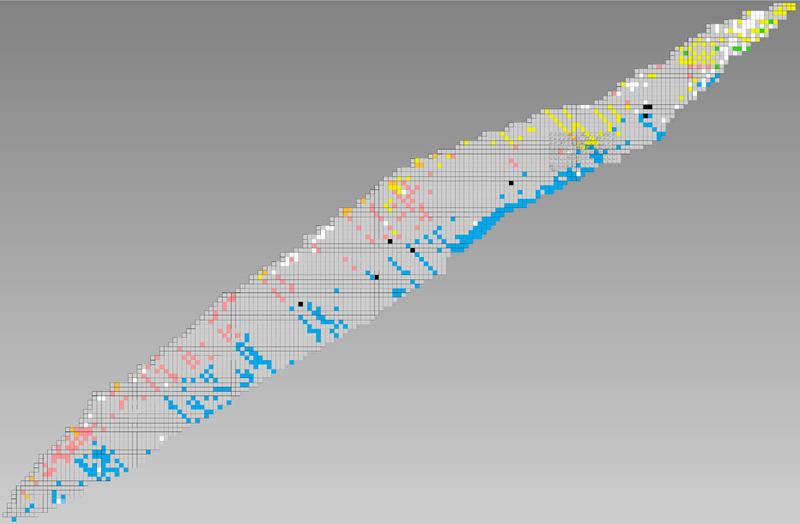 The column mod gives to total number of modified nuclides (includes new nuclides) in each edition. The column KNC gives the total number of ground states and metastable states in each edition. 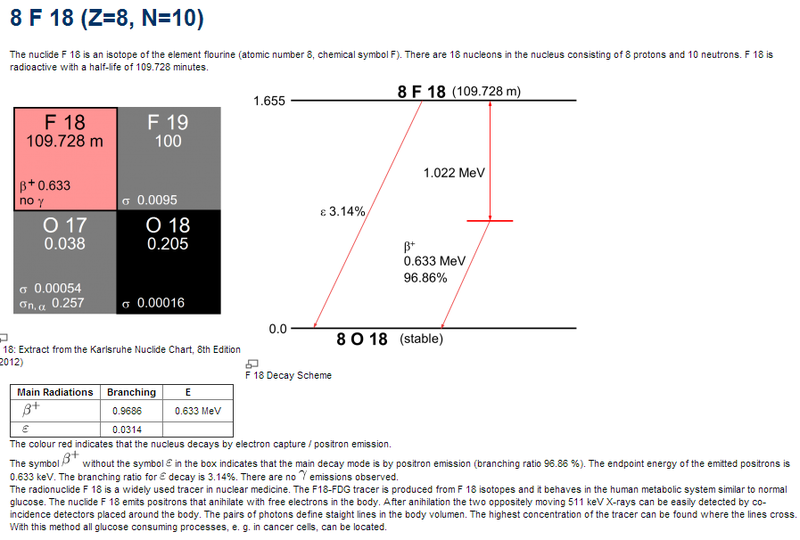 Also shown in the KNC column is the total number of elements and the total number of fission products included in each edition. The legend shows in more detail the particular colours used for decay modes or half-lives. The icon leads to the What the colours mean (shown below). The icon leads to the modes of radioactive decay page. Radioactive decay processes on the nuclide chart (see below): A “parent” with coordinates Z, N transforms to the “daughter” product through the decay process shown. Activation processes and nuclear reactions on the nuclide chart: a target nuclide with coordinates Z, N transforms to the nuclide Z’, N’ through the processes shown. The reaction can be written Z+NX(a,b)Z’+N’Y where a and b are the incident and exiting particles respectively. The icon leads to the How to use the KNCO++ page (shown below). The icon leads to the Physical Constants and Conversion factors page (shown below). The icon leads to the Periodic Table of the Elements web page (shown below). The icon leads to the Element Information wiki page (shown below). The icon leads to the Element Properties page (shown below). The icon leads to the Reduced Decay Schemes application (shown below). Progress in nuclear data can be best summarised by displaying the differences between the previous editions of the Karlsruhe Nuclide Chart. In the so-called “difference” chart, the coloured boxes indicate new nuclides and updated nuclear data not found in the previous edition. Nuclides with unchanged nuclear data are shown as grey boxes. In the new 10th edition, for example, there are 47 new nuclides not listed in the 2015 edition and 649 updates indicated by the coloured boxes. This data comprises half-lives, branching ratios and decay modes, and energies of the emitted radiations, etc. The icon leads to the Fission (Shape) Isomers page (shown below). The Blog icon leads to the Karlsruhe Nuclide Chart blog (shown below). The Glossary icon leads to a dedicated Karlsruhe Nuclide Chart glossary (shown below). This page is supported and maintained within the Nucleonica nuclear science portal. This page was last modified on 24 July 2018, at 15:07. This page has been accessed 169,543 times.